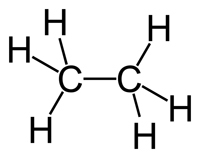 Ethane is a chemical compound with chemical formula C2H6, structural formula CH3-CH3. It is an alkane, that is, an aliphatic hydrocarbon. At ordinary pressure and temperature ethane is a colourless, odourless gas; boiling point is ?88.6°; melting point is ?183.3°.